Blog: The Fallacy of the "Maker's Mark"
The section reproduced here is from my page about sponsor's marks. The requirement for a sponsor's mark to be struck on gold and silver items as part of the hallmarking process was introduced by an Act of King Edward III in the year 1363. The mark was intended to identify the master goldsmith who would "answer", i.e. be punished or fined, if an item was found to be of substandard quality. It was never intended to identify who actually made an item. In strict terms it was a responsibility mark but it was not given any name in the 1363 Act. A master goldsmith in the fourteenth century working under the strict rules of the goldsmiths' guild, with a small workshop and a couple of journeymen and apprentices, might naturally have been thought of as the "maker" of an item made in his workshop and, understandably but unfortunately, the mark became referred to as the "maker's mark", and some of the subsequent Acts did not clear this up. When the power of the guilds to control who could work in precious metal declined, and with developments in trade and commerce, it became necessary to allow people such as retailers and importers to enter a mark so that they could send items for hallmarking. This was first officially acknowledged in the 1738 Plate Offences Act, although it is obvious that the practice existed well before 1738. It has therefore been misleading for at least 300 years to think of this mark a "maker's mark", that was never its purpose. The Gold and Silver Wares Act, 1844, introduced the term "private mark" as a result of such considerations. Since then the term "sponsor's mark" has been adopted and is the name used for this mark in the 1973 Hallmarking Act. Helen Clifford puts the position clearly in "Silver" (ISBN: 9781851771899) edited by Philippa Glanville OBE, FSA, formerly chief curator of the metal, silver and jewellery department of the Victoria and Albert Museum and an authority on silver. Clifford says that the mark "could refer to any of the specialists involved in its production or the retailer, depending on who was responsible for taking it to the assay office", about which remark Philippa Glanville writes "The myth of the 'maker's mark' is unravelled, challenging a century of silver studies." To assume that the marks alone tells you who made the item is wrong. The term "sponsor" has as one of its meanings "one who takes responsibility" for something. The term "sponsor's mark" therefore accurately reflects the legal significance of the mark, and for preference should always be used to avoid confusion. The image here shows a clear example of why this is the case. A neighbour of mine made some silver items when he was at college in the 1970s. He was not registered with an assay office so he was unable to get them hallmarked. Recently, worrying that when his children inherit the items they might not recognise what they are, he asked if I could get them hallmarked, which I did. In the image you can see my sponsor's mark, DBB set in a rectangular shield with pointed ends, followed by a set of London Assay Office hallmarks with the date letter "r" of 2016. 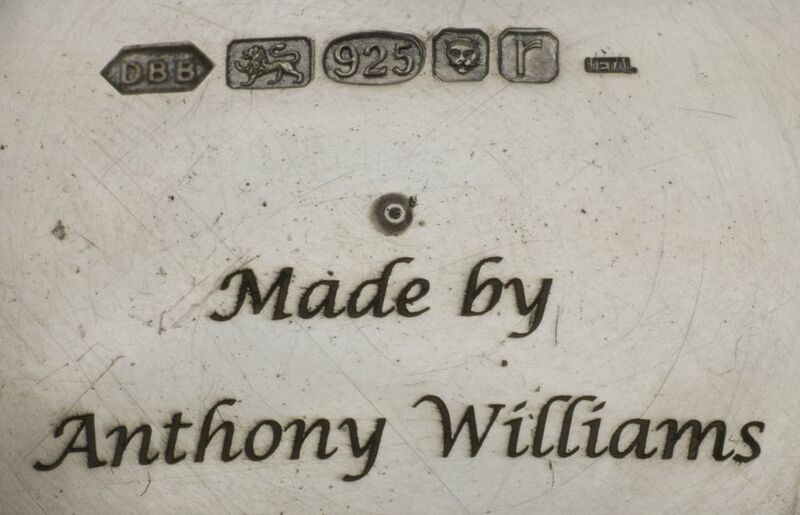 Underneath has been laser engraved the statement "Made by Anthony WIlliams" identifying the real maker. The assay office both stamped my sponsor's mark and laser engraved the maker's name. When I was discussing this with them there was no confusion at all, they understood perfectly the difference between the sponsor and the maker. I think this is a neat illustration of why the sponsor's mark should not be called a maker's mark. There has never been a requirement under British law for the maker's name to appear on a hallmarked item. In case this is thought to be only a recent consideration brought on by the 1973 Hallmarking Act, which was the first piece of legislation to use the term "sponsor's mark", consider the work of Paul de Lamerie, the most famous English silversmith of the eighteenth century. According Philippa Glanville, it is known that de Lamerie, in common with many other goldsmiths and silversmiths, often subcontracted work to a range of other workshops. He had the finished items marked with his registered mark before submitting them for assay and hallmarking. Although de Lamerie also had his own workshop in which some items were made, the presence of Paul de Lamerie's mark on an item of gold or silver does not show who made it, which might have been a subcontractor or workmen in de Lamerie's own workshop, and therefore it would clearly be misleading to describe it as a "maker's mark". Unfortunately the sponsor's mark is still sometimes called the ‘maker's mark’ by people who don't really understand its true purpose and use. This gives rise to ridiculous statements such as Case also signed CN Charles Nicolet a known casemaker for IWC and The movement is Swiss and the case is silver, the watch was assembled and made by George Stockwell for Stockwell and Co Ltd in 1914 with the GS hallmark. These two statements are simply, completely and utterly wrong. Charles Nicolet was a director of Stauffer & Co. a large London company that imported watches made by the Swiss parent watch manufacturing company Stauffer, Son & Co. and from IWC and other Swiss manufacturers. Charles Nicolet's mark was entered at the London and Chester Assay Offices in order that Stauffer & Co. could send Swiss made watch cases to be hallmarked. George Stockwell's mark was entered for Stockwell and Co. a large company of carriers and importers who submitted watches for hallmarking on behalf of their Swiss customers. George Stockwell was a director of the company and never made a watch case or assembled a watch in his life! Stockwell & Co. started in 1907 to arrange hallmarking for Swiss companies that didn't have British offices, they were one of the first Assay Agents. Even today and knowing the truth full well, the term ‘maker's mark’ is often casually used by people who shouild know better, even at the assay offices, although usually these are not people in the actual assay and hallmarking section. The acid test is to ask them to guarantee that the registered person actually made the item, and then they will explain that that is not the purpose of the mark.